In 2017, 38-year-old Taiwanese actress Ady An (安以軒) tied the knot with wealthy Macau businessman Levo Chan (陳榮煉) after two years of dating. Following a lavish seaside wedding in Hawaii, Ady relocated to Macau for her husband, often flaunting their relationship on Weibo. And on the 15th, the star took to social media to announce she is a mother-to-be. 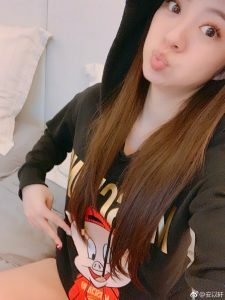 Her baby’s nickname is “66” as Levo’s nickname is “65.” Ady posted four photos along with the announcement. One of the pictures was of little baby shoes and two caps with the words “Mom” and “Dad” respectively. 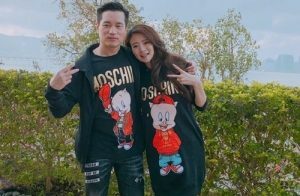 In the other photos, the couple was seen wearing Moschino and Warner Bros’ collaboration series Porky Pig. Netizens speculated that 66 is a piglet, with Ady’s due date to be in July or August. However, the actress is still slim and shows no signs of a baby bump. It is revealed that she will return to her mother’s in Taiwan for baby appointments and to give birth. About a year ago, Ady posted a photo of herself in the hospital and said she was there for a minor surgery. Speculations ran rampant that she was hospitalised for an ectopic pregnancy and had to surgically terminate it. In addition, it was rumored that Ady was a stepmother to Levo’s eight-year-old daughter from his previous marriage. However, she publicly denied he was married before and stressed that he does not have a daughter. 1 comment to Ady An Announces Pregnancy! Congrats Ady. I have been waiting for this great news. the shoes (baby boy is on the way).